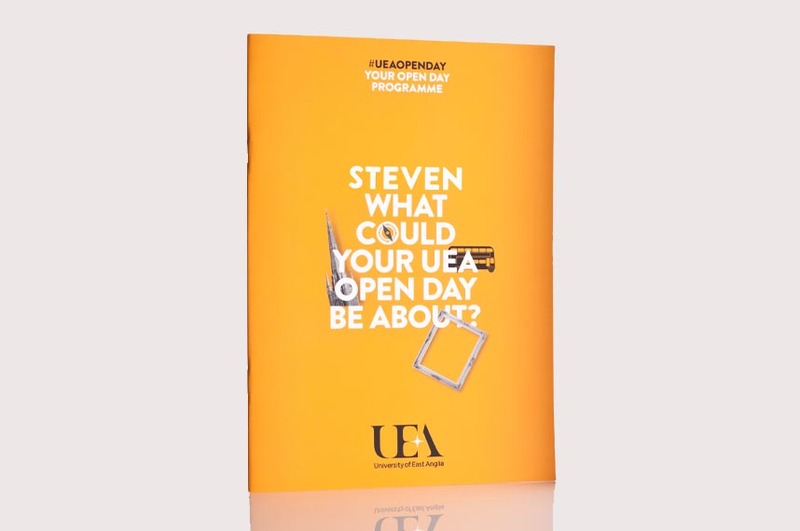 We deliver a fully engaged Open Day pack for prospective students at the UEA. For a couple of years now we’ve worked with the UEA to help encourage prospective students to visit the campus and get a feel for what it’s like to study there. The traditional, and essential, information pack and campus map handed out on arrival were fine, but we wanted to engage with potential students earlier and more personally. What’s interesting is that we saw print as a key ingredient. Interacting with the demographic of soon-to-be students might lead you to believe that digital communication would be the only answer. The fact is that for this age group, digital has become the norm, so we wanted to give them something tangible and personalised: something that to the digital generation had added impact. We integrated all of the technology at our disposal, which pretty much typifies the Page Bros ethos of drawing on centuries of printing experience meshed with cutting edge modern thinking. Visitor numbers were expected to be high, so for a large run we printed the main contents of the pack in advance, using high quality litho methods. To make the packs even more special, we added a soft-touch lamination to the covers. With the packs held in our stock control system, we then liaised with the UEA, weekly, to acquire a database of people who would be coming. The data, from registrations on the UEA website, included names, addresses and visit dates. Switching to digital print, we used that data to produce individual, personalised greetings on the front covers. We also digitally printed their address details on the reverse. And, to keep postage costs to a minimum, we used our in-house technology to print a mail-sort code on the packs too. We can handle fulfilment too, so we inserted an A2 campus map, folded down to A5 in every book, and we even put the finished material into window envelopes, for direct mail-out. Recipients got an impressive and interesting pack, made all the more special because it was tangible, touchable and totally theirs. It’s a brilliant example of how we can offer many of our services and techniques in an integrated campaign. Using litho printing, digital techniques, online interactivity, personalised and highly-targeted marketing, not to mention the practical aspects of stockholding, inserting and mailing out, it proves our point when we say that at Page Bros we print, we create, we fulfil, we enable.